Is 'traveling' the same as 'a holiday'? For me, travel conjures up images of moving from place to place, being out most days looking at sites and having new experiences. 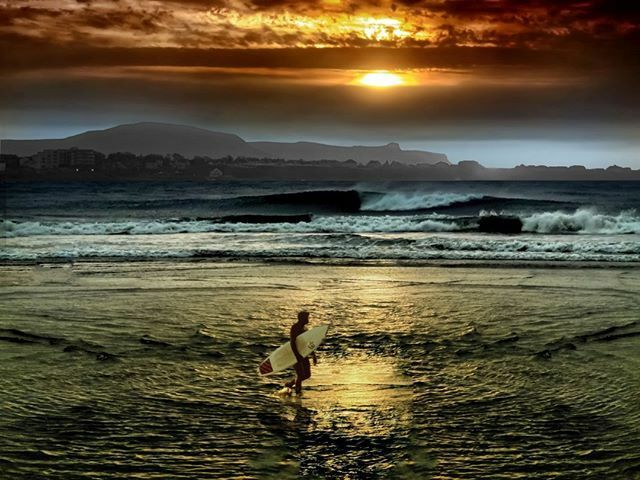 A holiday is going to a destination and staying put. No housework. No responsibilities. Just relaxing. And writing. 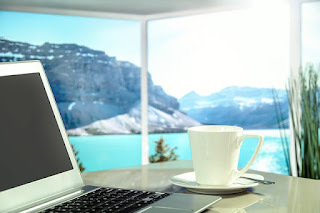 Yes, a perfect holiday would be going somewhere that has no daily distractions and interruptions, but has a beautiful view, wi-fi and few hours a day to sit and write, and evenings to chill out with my man. I recently accompanied him to Fiji where he was working. With no car, so no means of going anywhere interesting, no TV and no company during the day I had little option for keeping myself occupied other than writing. And I wrote more than I ever had in the same time-frame at home. With my laptop on the balcony, a view of Suva harbour and a beautiful cool breeze, I'd write in 100 words sprints from mid-morning to mid-afternoon and my ever-increasing word count spurred me on even more. I felt so productive and motivated. I'm currently in the midst of writing/editing two contributions to upcoming box sets and as I sat in my office, stared at the screen, then got up and put on a load of washing, or ducked out to the shops, or binged on a TV series I joked about how we need to go back to Fiji so I can get the words done. But he's headed off to PNG (Papua New Guinea) which isn't a particularly safe place so I'm still at my desk at home, daydreaming about locations where I'd be inspired to happily set up my laptop and pump out the words. BALI - I spent some family time here a while back and love the place. 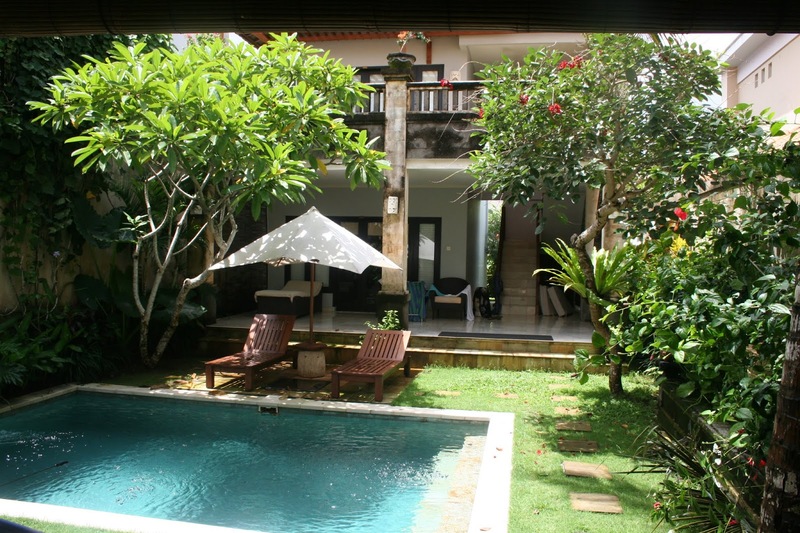 This villa at Jimbaran was away from the main tourist areas and was tranquil and relaxing. Sitting on one of those sun lounges again, or on the plump sofa in the living area, with all that greenery, the sparkle of the pool and the quiet of the surroundings would not only be conducive to gluing my bum to the seat and writing, but there is nothing to distract me - well apart from ordering some delicious nasi goreng or slipping into the cool water, but there's only so much time you can spend in the pool! 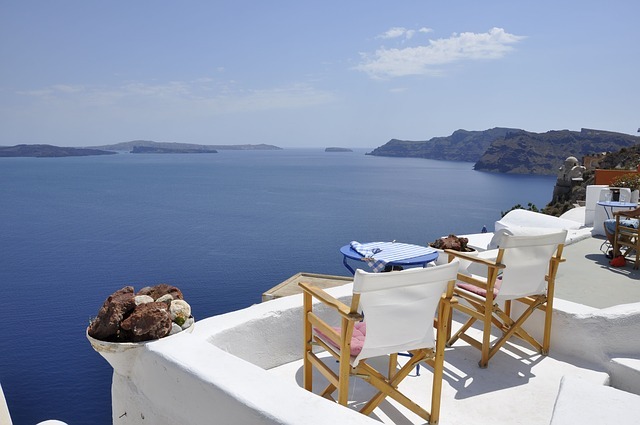 SANTORINI - One of those deck chairs has my name on it. Looking out to Mediterranean Sea, on the terrace of one of the iconic white buildings on this beautiful Greek island, who could not be inspired to create a story about love? I would have to take some time off from writing to indulge in one of my other passions - photography - but if this was my writing spot for a week or so, the words would flow and a glass of crisp white at the end of the day would be my reward. 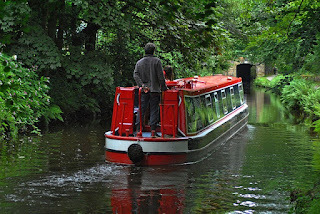 ENGLISH CANALS - I adore the English countryside. All that green is so beautiful and restful, but in a car on those narrow English roads and lanes you can't just stop and take in the scenery, or take photos. But on a barge (especially if someone else is driving) I could kick back on a comfy bed with my laptop as fields and villages drift by. No shops to tempt me away from my writing, no cafes or restaurants unless we tie up somewhere. 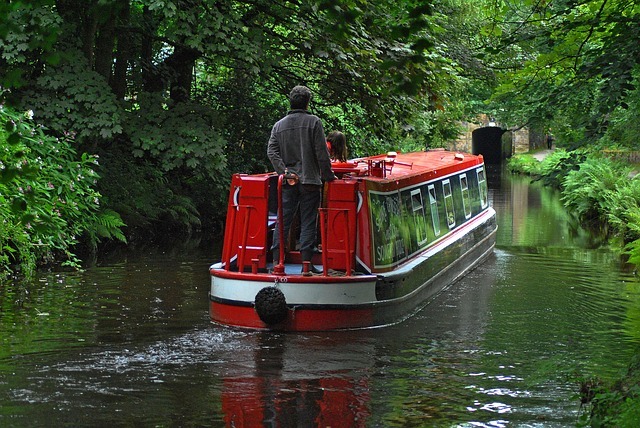 Just the ripple of the water as we float leisurely along the network of canals. I could finish my English historical! 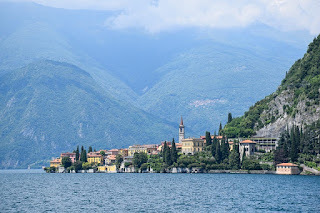 LAKE COMO - With my laptop (and camera) in hand, hopefully I can find a somewhere to sit and write with this fabulous Italian view. Maybe on a luxury water limousine, or just a spot on a grassy lake-side bank. It wouldn't even matter if it was cloudy like this, just being in this imposing landscape is inspiring in itself. I can guarantee that housework or gardening wouldn't be tempting me away from my writing. My affinity with water has finally translated to a story. The heroine from my current WIP is a Selkie, a seal shapeshifter from Celtic mythology. 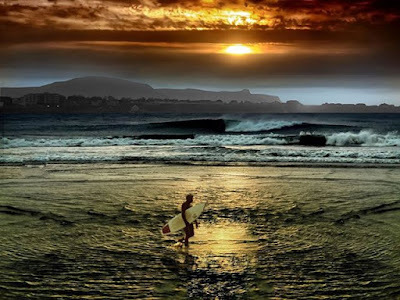 I wanted her hero to be a surfer and I was so excited to find that there are in fact Surf beaches in Ireland - there's even a music and surf festival in Bundoran which is the vague setting for my story. I know if I could be here to write, I wouldn't be procrastinating and finding the thought of washing floors so enticing. Andra, Me too! I'd go to any of those places. Interesting that we are both drawn to water but neither of us are good swimmers or even like being in the water. Going to the coast, beach or ocean (which word is your default describer depends on where you live in The States) is something I look forward to myself. Relaxing, inspiring, healing...many more words out there to describe the positive effects of time by the water. Beautiful vacation / writing spots. I try to go to the coast here in Oregon at least three times a year--four if I can. It provides exactly the respite from daily life that is needed. More than that I give myself permission not to do anything except write and walk the beach. Even my meals are quick and easy instant dishes so I don't have to think about what to make or how much prep time it takes. I'm not sure if I were in Fiji or many of the other places you describe that I would write as much because I'd want to be exploring. But I'm sure I could get at least a few words in about characters experiencing those beautiful places. Thanks Judith and Maggie - looks like we all share an affinity for water. It certainly helps with my word flow and just makes my mind peaceful. Maggie it was difficult to explore in Fiji with no transport but we did drive from Suva to Nadi through the lush green countryside which was gorgeous, then we enjoyed the luxury of a fancy resort and I have to say I wasn't anywhere near as productive there!